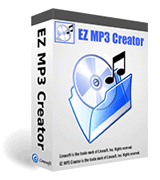 EZ MP3 Creator is a good tool used to extract digital music from audio cd and encode them into mp3, ogg, wma or wav files with perfect quality and high speed. 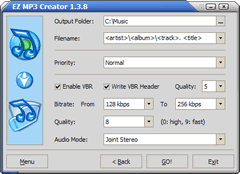 EZ MP3 Creator has the ability of querying cd information such as album, artist, track titles from freedb server over internet. The information can be saved as mp3 id3 tags or ogg/wma comments. 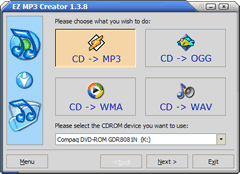 EZ MP3 Creator works with a wizard interface, so it is very easy to use. Normally, you need only a few clicks to create your music files. EZ MP3 Creator support multi-languages, now it supports nearly 40 different languages translated by users all over the world. If your native language is not supported, you might try translating it yourself. Make a copy of EZ MP3 Creator\Languages\English.lng, and rename it to your native language name (in English), then you can open it with notepad and translate it. After translating, please send the new language file to contact@linasoft.com, and you'll get a free license of EZ MP3 Creator.